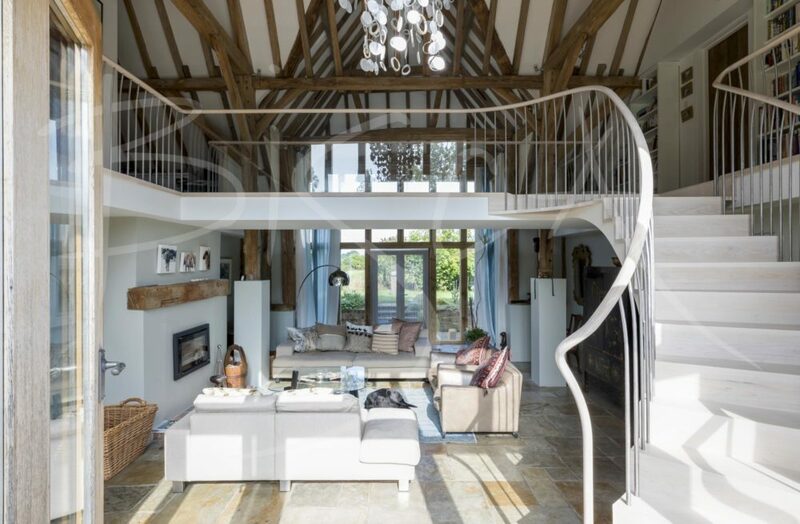 Replacement curved stair design for Hampshire barn conversion. The old staircase caused issues with head height and its position in relation to the front door. We created a lightweight curved stair design addressing these issues and more. 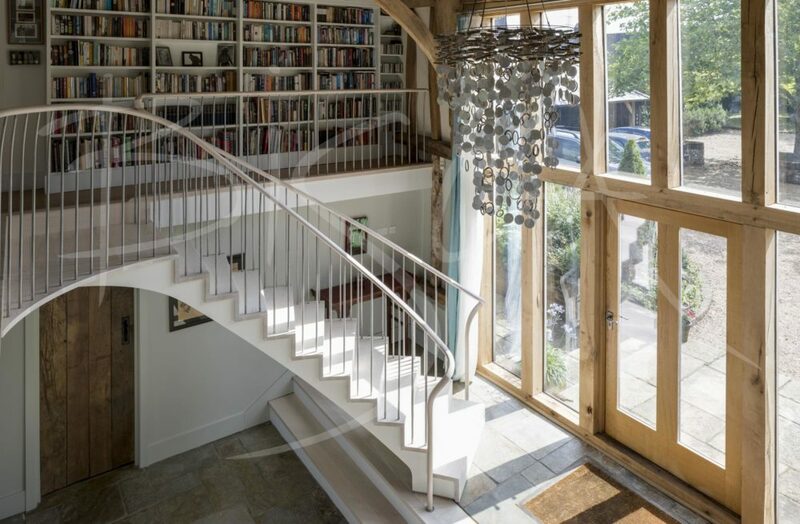 A sweeping staircase, with a curved top landing, transitioning the balustrade onto landing edges. The top landing is set one step down from the floor level. This design feature solves the issue of head height below the beam at first floor. A white painted stringer is set in from the edges of continuous ash treads and risers. The stringer flows from the raised entrance area up to the bridge. The balustrade on the staircase and first floor is of forged and tapered stainless steel uprights. The uprights have a gentle curve outwards at the top, further enhancing staircase curves. At the head of the staircase is a walkway. 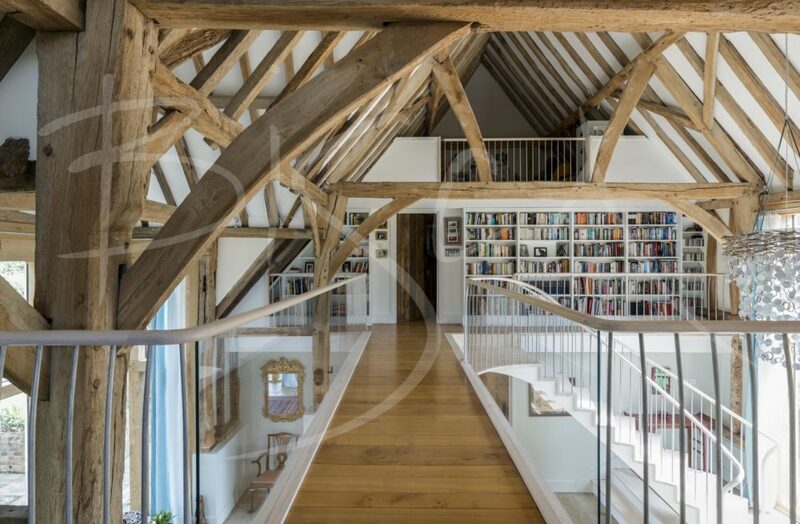 So as not to detract from the oak beam detail, at this point the uprights of the staircase give way to a low iron glass balustrade. An ash handrail caps the uprights, starting from feature newels at the foot of the stair. It then continues seamlessly over the glass balustrade of the walkway. 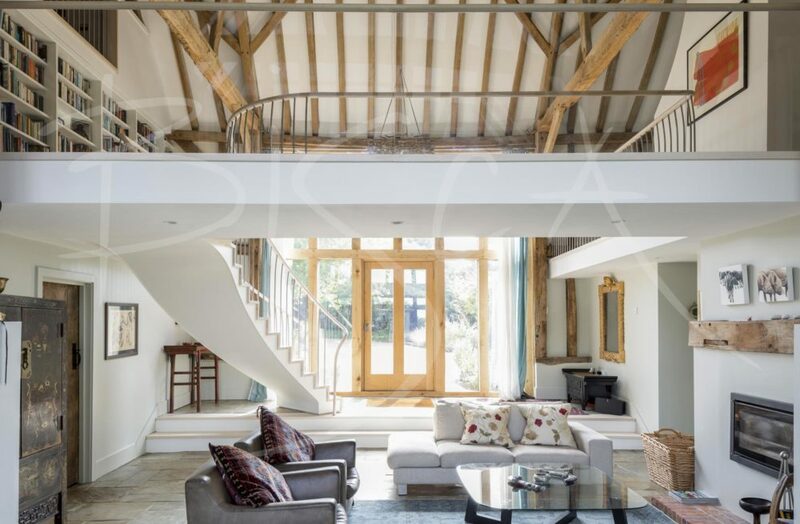 In a building filled with ancient oak beams, ash may seem like an odd choice of material. The overall effect however, is a calming effect on the room – part of the design intent. For more information on this curved ash staircase please reference 6135. This project features in our before and after section.